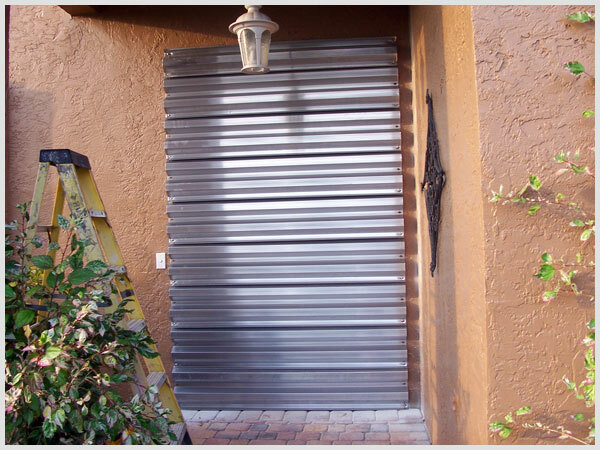 We offer aluminum and clear storm panel hurricane shutters. We price our panels by the square foot. Please let us know your window measurements so we can give you a free quote. Our removable Storm Panels provide the most cost-effective protection against the violent ravages of Hurricanes and Tropical Storms. Their rock-solid durability and easy set-up makes our Storm Panels an absolute necessity anywhere storms and hurricanes threaten the safety of your property. Our .050" and .063" aluminum storm panels, as well as our Protexan clear polycarbonate panels, have been engineered to meet the most stringent wind codes in the country and have been reviewed and accepted by the Miami-Dade County product control division, Florida Building Code, and the International Building Code. Our panels are designed to slip into an upper header track and fasten to a lower track with washer-based wing nuts. Our tracks are available in a white or bronze finish. Our panels can also be attached directly to the wall without tracks by concrete anchor and stainless steel screws. Our panels have a compact design that allows for easy storage in your garage or shed. We offer the highest-quality Storm Panels in the industry. Storm Panels are the most cost-effective way to protect your home during hurricane season. Our storm panels feature excellent durability and ease of installation. Your entire house can be secured in under an hour. Our Storm Panels can be easily stacked in your garage or even a closet when not in use. Ten panels stack to approximately one inch in depth. Our Storm Panels are the most cost-effective way to protect your home.